The main reason for moving to Italy was to learn the language. We also thought that the weather might be a little warmer, brighter and dryer. Whilst the latter was a secondary issue, right now we are beginning to wonder if the Roman Gods are being unkind to us. Looking out of the double windows opposite my desk, it could well be a view of English grey skies, and the sound of wheels splashing past the villa sound so wet and chilly. These days our Italian friends in the cafe bar in Fiano, talk as much about the ‘brutto Tempo’ (bad weather) as we brits did in the local pub after work in England. This is not a complaint, just an observation, well actually I am complaining, let’s be honest. However, I have just bought a lovely new pair of soft leather boots from Gabor and my beloved waxed coat has come out of the wardrobe. These may not sound important to you, but to little old me, these are two of the perks of winter. Farty Barty refuses to leave his nice warm chair. Meanwhile, Tuscany is still struggling with serious flooding and landslides. We are desperately waiting for the rain to stop and allow some of the poor homeless people to get back to repairing and rebuilding their homes. Our little bit of Chianti has so far suffered much less than some areas; may that continue. 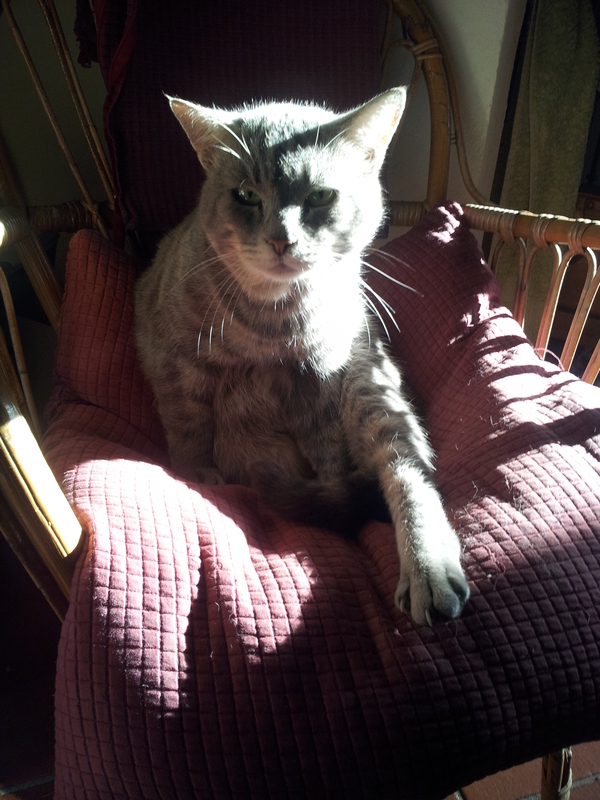 Farty Barty the cat, remains in his comfy kitchen chair and refuses to go out at night……that says a lot. But then all turned bright and sunny on the weekend, metaphorically speaking, when our beautiful nine, nearly ten-year old granddaughter came to stay for two nights. Absolutely no work or writing got done, we were forced to just relax and enjoy ourselves in her delightful company. We went out to lunch twice. 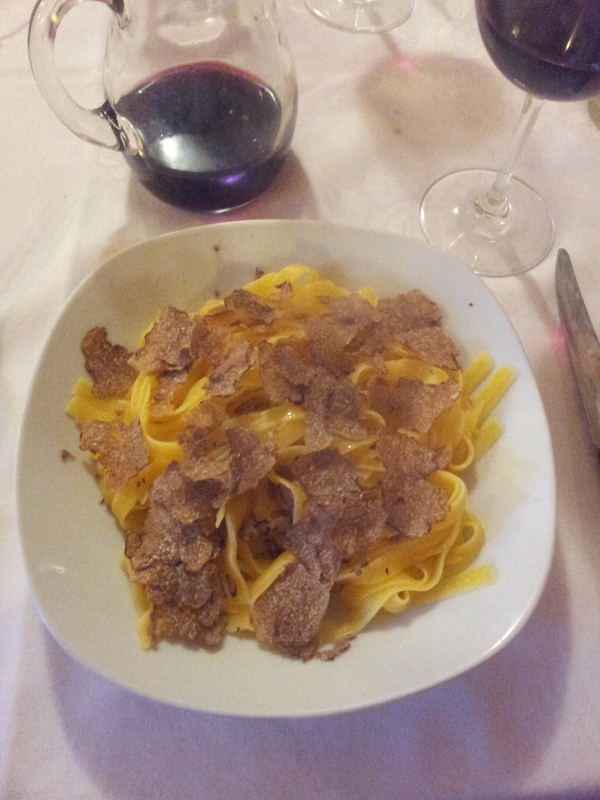 Firstly to Ristorante Montalbino for, yes again, white truffle pasta. It is a tiny family run place where they specialise in fungi and it’s really good. Then on Sunday we went back to La Gramola in Tavernelle, where we had the most delicious Red Wine Pici with cheese and pepper. This is home-made spaghetti infused with red wine, so comes out a sort of ruddy colour. It’s really delicious tossed in pecorino cheese and pepper. Then I had pears that had been poached in Vin Santo, a wine liqueur made from grapes that have been left to wither on the vine, or so I’m told! 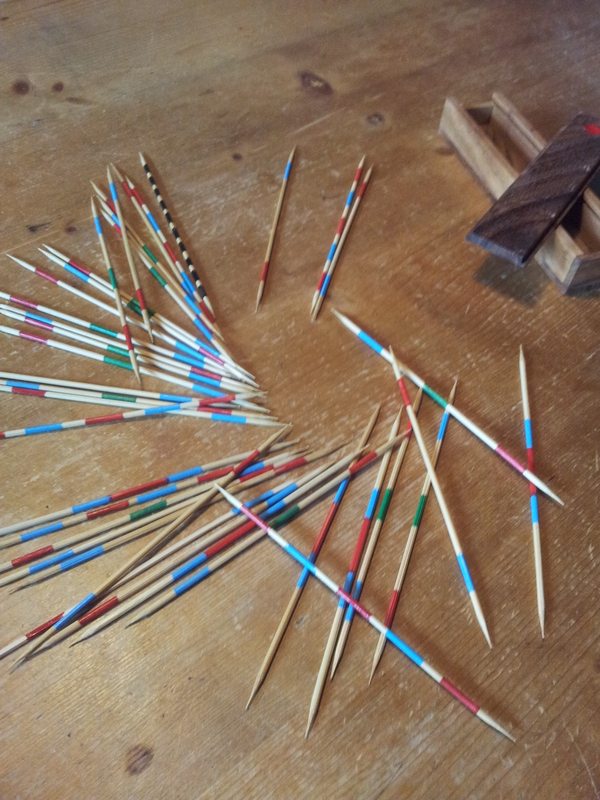 Back at the villa we played the games of ‘Sorry’ and ‘Pick’up’Sticks’. We also had a fun time, by having a book each, and reading the first full line of each page one after the other. This can be hilarious, however, our poor granddaughter had a John Le Carre book in her hands and he tends to write very long sentences. We were very impressed to find that her reading of difficult English words was brilliant. She is English, but when you consider that she has only been educated in an Italian school, speaks fluent Italian, and generally reads a lot of Italian books, so brava to her. Well, I hope that you will not mind if I cut this post a little short. I have a busy workload today and must knuckle down. Sounds like you’ve been having a good time despite the weather! I hope the rain stops soon. It’s cleared up here now so hopefully the sunshine is coming your way! !